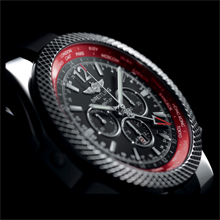 To celebrate the launch of the Continental GT V8 with its ultra-powerful new 4.0 V8 engine – the latest tour de force from the Bentley engineers – Breitling has created a 250 piece limited series of the Bentley GMT chronograph. 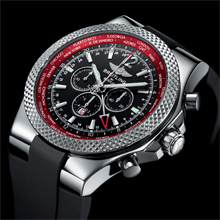 Its signature feature is the mobile inner city bezel distinguished by a metallic red shade creating a powerful and sporting contrast with the black dial. This vivid touch of colour refl ects the red background of the Bentley emblem that sets the Continental GT V8 model apart from other models by the British carmaker. The original and daring design of the steel case with its asymmetrical lugs is teamed with a bracelet or a rubber strap exclusive to this model. 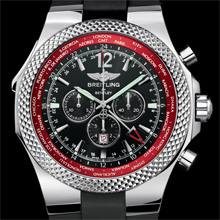 The selfwinding chronograph movement, chronometer-certifi ed by the COSC, offers another technical asset exclusive to the Breitling for Bentley collection: a “30-second chronograph” with a sweep seconds hand making one full turn of the dial in half a minute and thus enabling readings accurate to the nearest 1/8th of a second. With the Bentley GMT “V8”, it’s defi nitely time for performance. steel, 250-piece limited series. Water-resistant to 100 m. Screw-locked crown. Rotating pinion bezel displaying the 24 timezones. Cambered sapphire crystal, glareproofed on both sides. Diameter: 49 mm. Royal Ebony, metallic red inner bezel.